Iran rebuffed a request by the UN nuclear agency chief yesterday that it suspend uranium enrichment, and President Mahmoud Ahmadinejad insisted his country will not retreat ''one iota." The chief, Mohamed ElBaradei, looked much less optimistic after the four hours of talks with Iran's top nuclear negotiator, Ali Larijani, than he had when he arrived for the one-day visit and said the time was ''ripe" for a political solution to the standoff. ElBaradei, who is hoping to prevent a confrontation between Tehran and the Security Council, put forward the UN request for Iran to suspend enrichment until questions over its nuclear program are resolved. But Larijani indicated suspension was not an option. ''Such proposals are not very important ones," he told reporters matter-of-factly while standing next to ElBaradei at a joint news conference after the talks. Hours earlier, Ahmadinejad said enrichment was a line in the sand from which the Iranians would not retreat. ''We won't hold talks with anyone about the right of the Iranian nation (to enrich uranium), and no one has the right to retreat, even one iota," the president was quoted as saying by Islamic Republic News Agency. ''Our answer to those who are angry about Iran achieving the full nuclear fuel cycle is just one phrase. 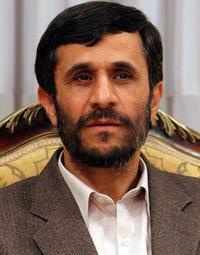 We say: 'Be angry at us and die of this anger,' " Ahmadinejad said. Iran says its nuclear work is solely for peaceful, civilian purposes, but the United States and several allies believe it seeks a nuclear arsenal. ElBaradei said the extent of the nuclear program was uncertain: ''We have not seen diversion of nuclear material for weapons purposes, but the picture is still hazy." During the 20 years of Iran's nuclear program, ''lots of activities went unreported," ElBaradei said. Higher-level enrichment makes uranium suitable for a nuclear bomb, although Western experts familiar with Iran's program say the country is far from producing weapons-grade uranium, reports the AP.